Over the past thirty years, 1970 to 2000, world tobacco consumption, production and trade have increased steadily. During the last decade, however, they have slowed down. This slowdown, or even decline in several cases, is more pronounced in developed countries, while tobacco production and use is still increasing in the majority of developing countries. Among the latter, China has been a major determinant of world trends with over one third of world tobacco production and consumption. Tobacco consumption in China, although growing more slowly, is still increasing. China, in addition, is an important importer and exporter of unmanufactured tobacco. The other major exporters are Brazil, the United States and India, while major importers are the United States, the EU and Russia. This chapter examines in detail observed trends and their determinants in tobacco production, consumption and trade during the period 1970 to 2000. The first section examines trends in consumption of tobacco leaf, cigarettes and other tobacco products. Tobacco leaf consumption in dry weight increased from about 4.7 million tonnes in 1971 to 7.8 million tonnes in 1997. This increase occurred almost entirely in the developing countries, most of it in China. The next section examines trends in the production of unmanufactured tobacco leaf. World tobacco leaf production increased from 4.7 million tonnes in 1971 to 8.9 million tonnes in 1997, but evolved differently in different regions, with a shift in production observed from developed to developing countries. A major increase in production has taken place in China, which increased its share in world production from 17 percent in 1971 to 47 percent in 1997. The following section examines trends in cigarette manufacturing and tobacco leaf usage and also the types of tobacco produced and used. Virginia flue-cured tobacco is the predominant type with increasing share in total tobacco production. Finally, the last section examines trends and developments in world trade in unmanufactured tobacco leaf and in tobacco products such as cigarettes. World trade in tobacco increased from 1.3 million tonnes in 1971 to 2.0 million tonnes in 1997, while trade in cigarettes increased fivefold during the same period. Tobacco consumption almost doubled over the examined period from 4.2 million tonnes in 1970 to over 7.4 million tonnes in 2000. Although tobacco consumption, unlike production, is not normally expected to experience wide fluctuations, available consumption data on apparent tobacco consumption are usually calculated from supply utilization accounts and consumption of tobacco products is calculated as production plus imports minus exports. Thus, much of the observed volatility in tobacco consumption figures can be attributed to fluctuations in stocks for which there are no available comparable data. Consumption of tobacco products is increasing rapidly around the world, but with strikingly divergent patterns. In developed countries, consumption per capita is higher but declining, while in the developing countries (where consumption per capita is lower) it shows an increasing trend. The major factors that fuel the increase in consumption in developing countries are principally high population and income growth. High income growth coupled with high income elasticities boost consumption of tobacco products in populous countries such as China, India and Brazil, thus increasing the share of developing countries in world consumption. However, other factors, for example advertising, also have a strong positive effect on consumption. Total tobacco consumption in developing countries increased, with an average annual growth rate of 5 percent, over the 1970 to 2000 period. Much of this growth should be attributed to China and, given China's position in world tobacco demand, developments in tobacco demand in China will be crucial for overall world demand in the future. Nevertheless, given that China has operated a more or less closed tobacco economy, very little change will be felt in the world market, unless the pattern changes considerably with China's admission to WTO. Tobacco demand is responsive to prices and taxes, and thus excise taxes represent an effective policy instrument for reducing consumption. Tobacco consumption is not similar to other products because it is addictive. Habit formation, therefore, represents an important determinant of consumption. For this reason counter-advertising, restrictions, labelling and anti-smoking campaigns have a strong impact on demand, particularly on youth smoking. Demand for tobacco leaf is derived from consumer demand for cigarettes and other tobacco products. This section examines consumption trends over the 1970 to 2000 period. It examines, first, overall tobacco consumption in tobacco leaf equivalent and then consumption of cigarettes and other tobacco products. World tobacco consumption increased by over 75 percent during the period examined, from 4.2 million tonnes in 1970 to reach 7.4 million tonnes of tobacco leaf equivalent in dry weight in 2000. Over 70 percent of the world total, that is about 5.3 million tonnes, is consumed in the developing countries and the remaining 2.1 million tonnes is consumed in the developed countries. 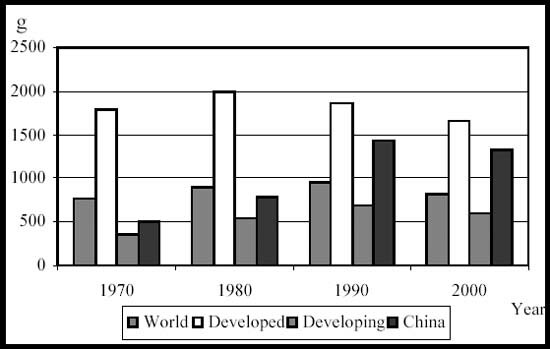 The trends over the examined period in developing and developed countries are quite divergent, as shown in Figure 2.1. Consumption in developed countries declined from 2.3 million tonnes in 1970 to 2.1 million tonnes in 2000, while consumption in the developing countries increased from 2.1 million tonnes in 1970 to 5.3 million tonnes in 2000. Much of the increase in developing country consumption is accounted for by China where consumption increased from a little under 0.7 million tonnes in 1970 to 2.6 million tonnes in 2000. Growth rates also vary considerably. World tobacco leaf consumption during the period 1970 to 2000 increased by about 2 percent annually. In developed countries tobacco consumption declined by 0.2 percent annually while in developing countries it increased by 3.1 percent annually. 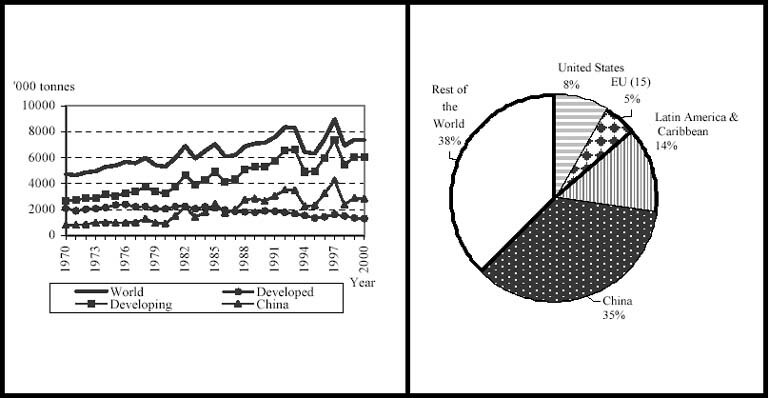 Consumption shares for the world in 2000, shown in Figure 2.1, were 9 percent for the European Union, 35 percent for China, 6 percent for the United States and 44 percent for the rest of the world. Aggregate consumption in developed countries declined over the period examined by 5 percent in total, or at an annual rate of 0.2 percent per year. With population growth, this implies a rather stronger decline in consumption per capita. This development can be attributed to various factors. First, income and population growth are slowing down considerably. Second, an increasing awareness of the health effects of tobacco consumption, together with the anti-smoking measures of governments including the intensification of campaigns against smoking, the banning of advertising and increased taxation, have had a strong negative effect on consumption of tobacco products. Among the developed countries the decline in consumption is most pronounced in North America where tobacco consumption declined steadily during the period 1970 to 2000 at an average rate of 1.3 percent per annum. In Europe consumption increased slowly to 1990, but subsequently declined by about 2.9 percent annually. Despite this decline, tobacco consumption in the European Union is still higher than in 1970 by 50 000 tonnes. Germany and the United Kingdom, followed by France and Italy, are the biggest markets for tobacco products in Europe. Tobacco consumption in the area of the former USSR, after a small increase to 1990 and a rapid decline during the period of transition in the early 1990s, is increasing steadily and shows a growth of 1.1 percent per annum during the period 1970 to 2000. In the other developed countries group, including Oceania, Japan, Israel and South Africa, tobacco consumption has followed a slow decline with an average annual rate of about 0.7 percent during the examined period. 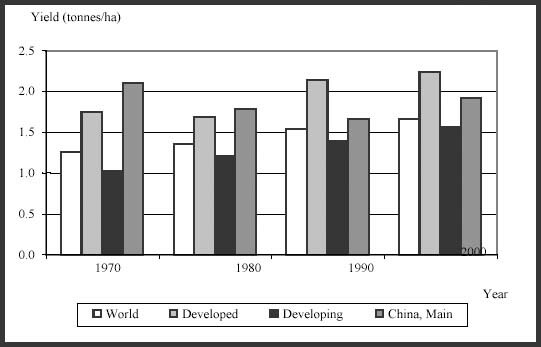 In sharp contrast to the developed countries, consumption in developing countries increased rapidly during the period 1970 to 2000, with growth averaging about 5 percent per annum. Aggregate consumption increased by 70 percent over the thirty-year period. This is due to a large extent to developments in the two most populous countries of the world, China and India, but also to a rapid increase in tobacco consumption observed across all developing countries and is related to a large extent to population and income growth. In China aggregate tobacco consumption increased more than fivefold from 0.8 million tonnes in 1970 to 4.2 million tonnes in 1997. After 1997 however, consumption declined and it was estimated at 3.1 million tonnes in 2000. This wide fluctuation in apparent consumption is attributed to the large build up of stocks during the early 1990s which in a supply utilization account show up as apparent consumption. Also, it is assumed that large stocks are held at the household level due to the consumption behaviour in China where packs of cigarettes are often offered as gifts. Therefore, real aggregate consumption is more modest than the 1997 figures show. The 2000 figure of 3.1 million tonnes is however regarded as close to reality and this represents a consumption increase between 1970 and 2000 of 4.4 percent per annum. In India total consumption has been increasing as in many other countries, notwithstanding the increasing awareness of the ill-health effects of tobacco consumption. Aggregate consumption has doubled in the thirty-year period from 275 000 tonnes in 1970 to 550 000 tonnes in 2000, representing an average annual growth rate of 3.3 percent. Non-cigarette consumption represents about four fifths of total consumption in India and this has remained more or less stable during the period. These tobacco products include particularly bidi, a kind of hand rolled, non-manufactured cigarette, produced by the informal sector, as well as natu, hookah, snuff, etc. About 80 percent of smokers live in the urban areas. The consistent growth in the bidi sector is mainly due to the lower level of taxation which has provided a considerable price advantage to bidis over cigarettes. Other factors that account for the rapid rate of growth in bidi consumption is the traditional habit of bidi smoking in the family which is passed on to the young, the relatively low income among a large population especially in rural areas and the increased use of bidi by women. The smokeless tobacco products, commonly used by the rural masses, were not taxed until the early 1990s, and currently are taxed only lightly. In contrast, taxation of cigarettes has increased by almost 15 times since 1970, encouraging many cigarette smokers to become consumers of bidis. The Indian tobacco market seems to be highly price sensitive. In other countries of the region consumption has also increased. In Indonesia aggregate consumption increased three and a half times or at a rate of about 5.5 percent per annum. In the Philippines, in the period 1970 to 2000, consumption increased tenfold, whilst in the Republic of Korea it almost doubled. In Latin America aggregate tobacco consumption experienced an increase of 2.8 percent per annum. Brazil is the largest market, accounting for half the region's consumption. Consumption in Brazil increased over the 1970 to 2000 period at 2.0 percent per annum. Total regional consumption declined in the 1980s due to a decline in incomes, but it started increasing again in the 1990s. Similar consumption patterns are followed in the rest of the region. In the Near East region the major market is Turkey with about half of the regional consumption. Aggregate consumption in the region doubled from 140 000 tonnes in 1970 to 300 000 tonnes in 2000. In Africa aggregate tobacco consumption increased steadily but modestly from 160 000 tonnes in 1970 to 235 000 tonnes in 1999. Although tobacco is consumed all over the world, consumption of tobacco products varies widely from region to region. Cigarette smoking is the most prevalent type of tobacco consumption. Manufactured cigarettes, together with the hand rolled bidis consumed in South Asia, account for about 85 percent of all tobacco consumed worldwide. However, in some regions, such as South Asia, unmanufactured tobacco is also widely consumed. There are four common types of cigarettes consumed: (a) Virginia type, made from manufactured flue-cured tobacco, consumed mainly in the United Kingdom and North America; (b) dark tobacco type, consumed mainly in French, Portuguese and Spanish speaking countries; (c) blended types, manufactured from various leaf types and consumed mainly in North America and internationally, manufactured under licence in various countries and sold world-wide; and (d) aromatic tobacco, made principally from oriental types of tobacco, consumed mainly in the Near East. World cigarette consumption increased from about 3 million tonnes in 1970 to 5.3 million tonnes in 1999 (see Figure 2.2). Details of the evolution of cigarette consumption by country and region are given in Annex A. Total world cigarette consumption increased during the period 1970 to 2000 at about 2 percent annually. There are striking differences, however, in the evolution of cigarette consumption between developed and developing countries. Total consumption in developed countries increased from 2 million tonnes in 1970 to 2.2 million tonnes in 1999, or an increase of just 10 percent over the thirty-year period. At the same time, cigarette consumption in developing countries increased from 1 million tonnes in 1970 to almost 3 million tonnes in 2000 or a threefold increase over a thirty year period, representing an annual growth rate of about 6 percent, as shown in Figure 2.3. Much of the difference in consumption patterns in developed and developing countries can be attributed to differences in population and income growth. Consumption per capita increased in developing countries at a much slower rate, while it declined in developed countries. The proportion of adults who smoke has declined, although more women have taken up smoking. 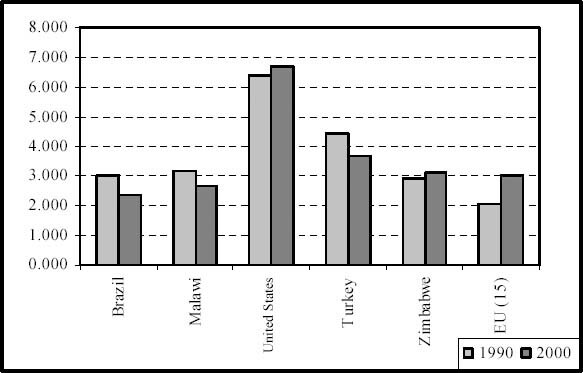 As a result of such trends, developing countries now have a much higher share in world cigarette consumption, with China, the United States and the EU leading in cigarette consumption share (see Figure 2.2). An important development has been the rapid growth in demand for filter-tipped cigarettes and the demand for 'light cigarettes'. The increasing consumption of filter-tipped cigarettes had a profound impact on the demand for tobacco leaf and the tobacco industry worldwide. The introduction of filters reduced tobacco leaf use in cigarette manufacturing by as much as 30 percent in comparison with thirty years ago. Furthermore, several other innovations in cigarette manufacturing, such as the introduction of additives, looser packing, reduction of waste, etc, have further reduced demand for tobacco leaf at the industry level. In developed countries, cigarette consumption per capita peaked at about 2000 grams per capita per year in the early 1980s and subsequently declined. Overall, during the period 1970 to 2000, cigarette consumption showed a slow annual increase of about 0.4 percent. Among developed countries, Japan's cigarette consumption increased from 237 000 tonnes in 1970-72 to 332 000 tonnes in 1999 showing a growth rate of 0.7 percent per annum. In the area of the former USSR consumption increased from 387 000 tonnes in 1970-72 to 472 000 tonnes in 1999. On the other hand, United States cigarette consumption declined from 600 000 tonnes in 1970-72 to 457 000 tonnes in 1999, showing an average decline of 0.9 percent per annum. During the same period the EU (15) experienced an increase of 1 percent per annum. Other developed countries also showed stability or small declines in cigarette consumption. Total cigarette consumption increased in developing countries by 3.7 percent per annum, a rate almost ten times higher than that of developed countries. The highest growth is observed in the Far East, including the two most populous countries of the world, China and India. China is the world's major cigarette consumer. Consumption increased from 388 000 tonnes in 1970-72 to 1 655 000 tonnes in 1999, representing an increase in cigarette consumption of 4.8 percent annually. Cigarette consumption in India is growing, but represents about 20 percent of total tobacco consumption in that country, the remainder being of non-cigarette products. Latin America experienced an increase in cigarette consumption of 0.5 percent. Brazil is the most important consuming country followed by Argentina and Mexico. In Africa consumption of cigarettes is low but increasing rapidly, in particular in North Africa and Nigeria. In the Near East consumption is also increasing rapidly with Turkey the most important consuming country. Most tobacco consumption is in the form of cigarettes. In fact, cigarette consumption represents more than 80 percent of total tobacco consumption worldwide, the rest being cigars (about five percent of total tobacco consumption) and unmanufactured tobacco products such as bidis, etc. Consumption of cigars amounts to about 100 000 tonnes or just over five percent of aggregate consumption of tobacco products. At the same time, consumption of cigars is decreasing rapidly in developed countries, although it is declining less rapidly in developing countries. In India, consumption of unmanufactured tobacco products accounts for 80 percent of total tobacco consumption, such as bidis, chewing tobacco and other products of smokeless tobacco. Bidis are manufactured in the informal sector and are not produced by tobacco companies. The major factors contributing to tobacco consumption have been global population and income growth. World population increased from 3 923 million in 1970-72 to 6 288 million in 1999 (for details see Table A.a). In developed countries the increase was rather slow (from 1 087.4 million in 1970-72 to 1 302 million in 1999), while in developing countries there was a major increase from 2 835.4 million in 1970-72 to 4 986 million in 1999. World population during the period 1970 to 2000 increased by 1.7 percent annually, ranging from 0.6 percent for developed countries to over 2 percent for developing countries. In China, population increased at 1.4 percent annually, while India experienced an annual growth rate of 2 percent and the Near East 2.7 percent. Tobacco is consumed mainly by the adult population. With population growth slowing down, the share of adult population in total (that is the number of potential smokers) increases. About 70 percent of world population is over 15 years of age, ranging widely from about 58 percent in Africa to above 80 percent in developed countries. The difference between developed and developing countries is striking, although some developing countries such as Brazil and China are catching up rapidly (respectively 75 percent and 78 percent in 2000). Global income increased during the period 1970 to 2000 by slightly over 3 percent annually. In developed countries income increased by almost 3 percent annually, while in developing countries it increased by about 4 percent. The highest growth was observed in China with growth of about 8 percent. The income elasticity of demand for tobacco products is found in the literature to be between 0.2 and 0.8. It is higher in developing countries and lower in developed countries, that is, as income per capita increases, the income elasticity of demand for tobacco products declines (see Zhang, 2000). Other factors influencing demand for tobacco include prices, habits, taxation, smoking restrictions, the most important of which is the retail price of tobacco products. The retail price, however, typically includes a very large excise tax which constitutes the largest part of the retail price. The share of tobacco leaf in the total cost of the final tobacco product is very small. Demand for tobacco products is rather inelastic. The price elasticity of demand for tobacco products varies considerably from -0.9 in most developing countries to -0.2 in developed countries. It has been found that as income per capita increases, the price elasticity of demand for tobacco products declines (see Zhang, 2000). Consumption of tobacco products is a significant source of tax revenue for all countries. The level of taxation varies considerably between countries and across products. For example, cigarette taxation is very high in some countries, such as the United Kingdom, while it is much smaller (as a percentage of the retail price) in others, such as the transition economies of Eastern Europe. In certain countries, such as India, the various tobacco products are taxed differently. For example, cigarette consumption is taxed highly, while bidis are taxed lightly. Taxation is probably the best public policy measure to reduce consumption of tobacco products. Given that price elasticities of demand differ by income class, with demand in the high-income strata being less price-elastic (around -0.2 to -0.3) and low-income strata having higher price elasticity (around -0.7 to -0.9) the impact of taxation is borne mainly by the higher income strata. Also, more low-income people reduce smoking as a result of an increase in taxation. Consumption of tobacco is different to that of other products because it is addictive. Habit formation is the most important determinant of smoking patterns as studies around the world reveal. It is because of this that advertising is important in recruiting new smokers in particular among the youth. Advertising has been responsible for the observed increase in tobacco consumption in many countries, while the counter-advertising and the anti-smoking campaigns have also had significant impacts on tobacco consumption. Smoking restrictions and labelling on tobacco products with warnings have an impact on consumption. However, in countries with rapidly increasing incomes and population, the strong positive effect of population and income growth on cigarette consumption outweighs the effect of smoking restrictions and labelling. In recent years trade liberalization in many goods and services, including tobacco, has been implemented as a result of various international trade agreements. The removal of trade barriers introduces greater competition, lower prices, advertising and other activities that stimulate demand. Results of various studies show that cigarette consumption in countries that liberalized their trade has increased by about 10 percent more than had markets remained closed. As a result, it can be concluded that trade liberalization contributed significantly to the observed increase in cigarette consumption, particularly in the low and middle-income countries. Tobacco is a differentiated product with certain characteristics that influence its production, consumption and trade patterns worldwide. Tobacco production takes place in many countries around the world in a variety of climates and soils, and it is used to a large extent by the producing countries themselves. Tobacco is produced in more than 100 countries in a variety of climatic conditions and soils. The major producers are China, the United States, India, Brazil, Turkey, Zimbabwe, Malawi and the EC. These produce more than 80 percent of world production. World tobacco leaf production in dry weight increased from 4.3 million tonnes in 1970 to 8.1 million tonnes in 1997 (which was an all-time high), an increase of almost 90 percent over this period. Growth was high in developing countries, while in developed countries tobacco production declined. This trend further reduced the share of developed countries in world production and, thus, their position in the world tobacco economy. The observed growth in production worldwide is attributed mainly to yield increases, while the area of land used for tobacco has, overall, remained rather stable. However, the area used for tobacco increased considerably in developing countries, while declining in developed countries. Policies supporting tobacco production in developed countries are under constant pressure and tobacco profitability at farm level is expected to decline further. Conversely, returns to tobacco production in most developing countries are much higher than in any other cash crop and thus there are good prospects for increasing production, especially for those types of tobacco with expanding world markets. Thus, not only do the developing countries have a higher share in world tobacco production, but they are also expected to increase it further. World tobacco production has evolved differently in different regions during the period examined, with a shift in tobacco production observed from developed to developing countries (see Figure 2.4). Production in developed countries decreased from about 1.9 million tonnes in 1970 to 1.2 million tonnes in 2000, a decrease of about 36 percent. In the developing countries it increased from 2.3 million tonnes in 1970 to 6.6 million tonnes in 1997 (a threefold increase) but subsequently declined to 5 million tonnes in 2000, representing a twofold increase over the period 1970 to 2000. The observed growth in world tobacco production largely follows the production trends of developing countries, where there was an increase from about 2.6 million tonnes in 1970 to 5.6 million tonnes in 2000. The developing countries increased their share of world tobacco production from 55 percent in 1970 to 81 percent in 2000. The main producer in the developing countries is China, where production increased from 805 000 tonnes in 1970 to 2.5 million tonnes in 2000, when China accounted for about 35 percent of world production and about half of the developing countries' production. (Figure 2.4). Globally, production of tobacco grew at an average annual rate of 1.3 percent during the period 1970 to 2000, but it was higher than 2.5 percent in the developing countries. China's production expanded at 3.8 percent annually, Brazil's at 3.0 percent, India's at 2.5 percent, Malawi's at 5.8 percent and Zimbabwe's at 4.9 percent. This should be seen against the negative growth of 1.5 percent experienced by the developed countries. The large divergence between developed and developing countries in growth rates of tobacco production is due to several factors. Tobacco use in developed countries has declined, while in developing countries demand both domestic and for exports increased rapidly, stimulating tobacco production. Support for production is on the decline in developed countries, and production costs have increased, while in the developing countries production costs are lower, and transportation has become easier. In most developing countries tobacco production is by far the most profitable among cash crops, particularly with the buoyant prices seen in the period to the mid-1980s, thus encouraging expansion of tobacco production. In addition, some of the production previously located in developed countries has been moved to developing countries with the establishment of multinational tobacco companies which invest heavily in large scale tobacco production. The area under tobacco increased from a little less than 3.7 million hectares in 1970 to a little over 4.1 million hectares in 2000 (Figure 2.5). This increase in the global area under tobacco was almost entirely in the developing countries, mainly in China. The area under tobacco in developed countries declined by half, from 1.2 million hectares in 1970 to 0.6 million hectares in 2000. At the same time area under tobacco in developing countries increased by 1 million hectares from 2.5 million hectares in 1970 to 3.5 million hectares in 2000. The countries that have the largest area under tobacco in the world are shown in Figure 2.5. In 1999, China accounted for 32 percent (1.4 million hectares), followed by India with 11 percent. The area under tobacco production increased in China from about 0.5 million hectares in 1970 to about 1.5 million hectares in 2000 with considerable fluctuation, such as reaching 2.3 million hectares in 1997. Average world tobacco leaf yields increased from 1.3 tonnes/ha in 1970 to 1.7 tonnes/ha in 2000 (see Figure 2.6). This was the result of an increase in developed countries from 1.8 tonnes/ha in 1970 to over 2.2 tonnes/ha in 2000, and in the developing countries from 1 tonne/ha in 1970 to 1.6 tonnes/ha in 2000. Zimbabwe experienced a major rise in yields from 1.3 tonnes/ha in 1970 to 2.5 tonnes/ha in 2000. In contrast to most countries, China experienced a decline in yields from 2.1 tonnes/ha in 1970 to 1.9 tonnes/ha in 2000 due to the expansion of tobacco production to new, less suitable areas, and where experience in growing tobacco is limited. Tobacco is a differentiated product, produced, used and traded in different ways around the world. Various types of tobacco are used in cigarette manufacturing, such as flue-cured, dark sun- and fire-cured, burley, oriental, etc. Flue-cured is the most common type amounting to about 60 percent of total world production. The highest observed growth between 1970 and 2000 was for the Flue cured type which is used in Virginia type cigarettes. Tobacco production is regulated in certain countries by monopolies, marketing boards or producers' co-operatives and thus tobacco consumption and production levels are not determined solely by the market. Various pricing mechanisms are used, with auction pricing in some countries and for certain types, and traditional marketing arrangements for other tobacco types. Such arrangements influence the pattern of production by enhancing the incentives to produce particular types. The developed countries share of world production declined from 44 percent of the world total in 1970 to 19 percent in 2000. Output growth in developed countries was negative during these three decades, with a faster decline of 3.4 percent a year observed between 1990 and 2000. North American production is dominated by the United States, where production declined by 400 000 tonnes between 1970 and 2000 - an average decline of 3.8 percent annually. Its share in world production declined from 20 percent in 1970 to 8 percent in 2000. The negative long-term trend in tobacco production in the United States is partly due to the strong pressure exercised upon the tobacco policy support programme since the beginning of the debate on the health consequences of smoking. The tobacco programme keeps prices high, but restricts quantities produced to predetermined quotas. Quota owners thus enjoy an annual income transfer from the budget through the programme. Opponents of the programme want it eliminated on the grounds that taxpayers' money should not be used to subsidise the production of health-damaging substances. Proponents of the programme claim that the programme restricts quantities produced and that its elimination would result in higher production of tobacco products and cigarettes. Production in Europe, split about equally between the European Union (EU) and the other Europe group (including the transition countries of Eastern Europe), declined between 1970 and 2000 from 640 000 tonnes to 530 000 tonnes, thus reducing Europe's share in world production from 14 percent in 1970 to 7 percent in 2000. There was a very small growth in output (0.2 percent) in the period to 1990, mainly due to a small increase in the EU, particularly in Italy. Tobacco production in the EU is supported by deficiency payments. There are no border measures, but producers receive a subsidy related to a production quota. The European Parliament has called for an elimination of production subsidies within five years. Although such a decision would not be implemented without the endorsement of the Commission and the Council, it is clear that there is pressure for the tobacco policy support programme to be discontinued. Tobacco production in other European countries, such as Bulgaria, was hit in the 1990s by the conditions of economic transition to a market economy. Although there is no significant support for tobacco production, the strengthening of the market economy and the normalization of market conditions will most probably give a boost to tobacco production. Production in the area of the former USSR, which was stable around 260 000 to 280 000 tonnes in the 1970s and 1980s, declined during the transition period to 120 000 tonnes in 2000. This decline amounts to an average of 2.5 percent a year in the period 1970 to 2000 and the share in global production declined from about 6 percent to about 2 percent during this period. In the other developed countries, including Japan, Israel, Africa and Oceania, production contracted by half from 220 000 tonnes in 1970 to 100 000 tonnes in 2000, that is by an average of 2.3 percent annually. This is mainly a result of the decline in production of more than 3 percent annually in Japan. The Far East is the major tobacco producing region of the world and in 2000 it produced 55 percent of the world's tobacco leaf. China is the major producer in this region with 35 percent of total world production and about 65 percent of Far East production. China experienced the highest increase in output during the period 1980 to 1990, with an average annual growth rate of 11 percent. During the decade 1990 to 2000 there was a decline in China's tobacco production of 0.6 percent annually. However, during the period 1970 to 2000 tobacco leaf production increased in China by 3.8 percent annually. China's tobacco production is under a State Monopoly which determines centrally all aspects of tobacco production, processing, cigarette production and trade of leaf and cigarettes. Production returns are often not higher than for other crops, but offer the advantage of lower uncertainty. India is the second major tobacco producer in the world with about 0.7 million tonnes of production in farm weight annually. India's production grew from 0.33 million tonnes in 1970 to 0.7 million tonnes in 2000. The growth rate remained stable over the entire period examined at about 2.5 percent per annum. About two thirds of tobacco produced is of non-cigarette types (such as bidi), but growth of flue cured Virginia type is increasing rapidly and it is regulated by a Tobacco Board. Inputs to tobacco production are subsidised from government. Tobacco is by far the most profitable cash crop and thus prospects for further expansion of cigarette tobacco for the growing world market are favourable. Turkey is the major producer in the Near East, and accounts for about three quarters of the region's tobacco production. During the period 1970 to 2000 Turkey experienced an increase in tobacco production of about 2 percent annually. Turkey is the main producer of oriental tobacco (about 65 percent of the world total). Tobacco is grown under rainfed conditions and in elevated areas, and it uses about 1.5 percent of the total cultivated area with labour intensive methods. Production policy for tobacco includes market intervention measures for price support by accumulating stocks, which are mainly of lower quality tobacco produced in the east and south east regions, as well as the general input subsidies received by other farmers as well. Support prices and thus domestic prices received by farmers for tobacco were about 25 percent higher than world prices in 1999. A reduction in domestic price support is expected to have a significant negative impact on production. Alternative crop activities, though less profitable, do exist. Africa is the only region that experienced a strong production increase during the period 1970 to 2000, averaging 3.7 percent per annum, but with significant fluctuations (5.7 percent, 2.1 percent and 3.3 percent in each of the three decades respectively). The main tobacco producers in Africa are Malawi and Zimbabwe, where production expanded rapidly during the 1970s and the two countries together account now for about half of Africa's production. Output in these two countries increased by about 9 percent per annum during the period 1970 to 1980. During the period 1970 to 2000 production increased by about 6 percent annually in Malawi and about 5 percent annually in Zimbabwe. In these two countries, tobacco is produced mainly in the large scale sector of professionally managed farms and very little in the small scale sector. The growth observed during the examined period was stimulated by high world market prices in the first half of the period, strong foreign direct investment by multinational tobacco companies, introduction of new tobacco processing technologies, improved transportation and improved access to international markets. Output of tobacco in Latin America rose by about 2 percent between 1970 and 2000. The region has a share of 13 percent in world tobacco production, of which Brazil accounts for 75 percent. The highest increase in production growth occurred for Brazil in the period 1970 to 1980, about 2.5 percent per annum, but this was followed by a major turnaround when a significant decline in growth was observed in the period 1980 to 1990, with a growth rate of only 0.9 percent annually. Overall, tobacco production in Brazil increased by an average 3 percent annually during the period 1970 to 2000. Production in Brazil has been stimulated by low production costs and by foreign investment from tobacco multinationals that focused almost entirely on the production of Virginia flue-cured tobacco to meet an expanding international market. It is estimated that more than 80 percent of tobacco leaf is used for the production of cigarettes. The rest is consumed in the form of unmanufactured products, cigars, etc. Cigarette production has, until recently, been located largely in developed countries for various reasons. First, consumption was concentrated in developed countries. Second, cigarette production is a capital intensive manufacturing activity and requires specialized technology, supply of materials and considerable research and development which were typically not available in developing countries. In addition, producing a consistent quality of the finished product places demands on the quality of the raw material. Technology is an important determinant of tobacco leaf usage in cigarette manufacturing. Recent developments in cigarette manufacturing reduce the tobacco leaf usage in cigarette production by as much as 15 to 20 percent. In addition, the increasing share in the market of filter-tipped cigarettes has also reduced leaf usage. World cigarette production increased from 3 million tonnes in 1970 to 5.6 million tonnes in 2000 due to increasing production in developing countries. In developed countries, cigarette production shows only a small increase from 2 million tonnes in 1971 to 2.5 million tonnes in 1991, remaining stable around this level since. As shown in Figure 2.7, the strongest increase in cigarette production is observed in China. China is the biggest cigarette producer with 30 percent of global production, 1 675 million tonnes, in 1999, up from only 0.39 million tonnes in 1970-72. (see Table A.1.3). Cigarette production in the developed countries increased by only 0.9 percent annually between 1970 and 2000, much more slowly than in the developing countries. Production in the EU increased by 1.8 percent during this period. The EU is the second largest cigarette producer worldwide, the United States is the third and the area of the former USSR the fourth. Cigarettes production in the EU averaged 0.45 million tonnes in 1970-72, and increased in the 1990s to 0.75 million tonnes annually (see Table A.1.3). Production in the Netherlands increased by about 6 percent per annum and the United States experienced a slower growth of 0.3 percent per annum. Cigarette production in the United States was 0.59 million tonnes annually in 1970-72, while in 1999 it was 0.65 million tonnes. In the area of the former USSR the production of cigarettes rose at 1.0 percent annually from 0.34 million tonnes in 1970-1972, to 0.42 million tonnes in 1999. In 1999 the EU produced 14 percent of the world's cigarettes, while shares were 8 percent for the areas of the former USSR, 12 percent for the United States and 36 percent for the rest of the world (Figure 2.7). Cigarette production in developing countries expanded at a rate of 3.9 percent annually between 1970 and 2000, and in that year accounted for a total of 55 percent of global production. Nearly 80 percent of developing country cigarette production is in the Far East region. In the Far East region, cigarette production increased by 4.4 percent per annum between 1970 and 2000. The fastest growth was in Indonesia where production increased five times (6.7 percent per annum) from 0.04 million tonnes in 1970-72 to 0.2 million tonnes in 2000. China showed the second highest growth rate among developing countries with an average production growth rate of about 5 percent per annum. In India there was a slow increase in cigarette production that averaged 1.5 percent per annum. The countries of Latin America and the Caribbean have a 5 percent share in world cigarette production. In the period 1970-72 cigarette production averaged 0.22 million tonnes per annum and after some fluctuations during the period 1973 to 1999 it reached the level of 303 000 tonnes in 1999 (Table A.1.3). In the Near East, tobacco production increased by 4.1 percent annually from 0.08 million tonnes in 1970-72 to 0.24 million tonnes, or 4 percent of the global total, in 2000. The major producers in this region are Turkey and Egypt. The production of cigarettes in Africa increased two and a half times from 37 000 tonnes in 1970-72 to 102 000 tonnes in 2000, a growth rate of 3.7 percent per annum, but this constitutes only 2 percent of the global total. Flue-cured tobacco is dominant among the various types of tobacco used in cigarette manufacturing. Out of 6.9 million tonnes of total tobacco leaf production in 1998, 4.0 million tonnes was flue-cured, representing 58 percent of the total. The other types include burley with 15 percent, dark air- sun- cured with 13 percent, and oriental with 10 percent. However, it is the development of the flue-cured type that characterizes the 1970 to 2000 period. Other types remained at much the same levels between 1970 and 2000 period (see Figure 2.8). The largest producer of flue-cured tobacco is China which produced 2.17 million tonnes in 1999. Other important producers are the United States, Brazil and Zimbabwe (Figure 2.8). Trade in tobacco was in the past almost entirely in the form of tobacco leaf. The proportion of tobacco traded as cigarettes, however, has increased rapidly. Tobacco leaf is not a homogenous product and thus it is difficult to speak about a world market of tobacco. Tobacco trade takes place for various types of tobacco leaf and many countries trade tobacco as both exporters and importers. About 25 percent of the tobacco leaf produced globally is traded internationally and this proportion has remained rather stable or increased slightly during the period 1970 to 2000. During the period examined, developing countries evolved as the major exporters of tobacco leaf with leaders Brazil, Zimbabwe and Malawi increasing their exports. Traditional exporters such as the United States, the EU and Turkey have been losing export market shares. At the same time the developed countries are becoming major importers of tobacco leaf with the United States, the EU, and the area of the former USSR having the largest import shares. Cigarette trade increased rapidly from the mid-1980s to the mid-1990s, but then showed a rather strong decline in the late 1990s. The world experienced a rapid increase in exports of tobacco leaf during the period 1970 to 1999. Exports of tobacco leaf averaged 1.32 million tonnes in 1970-72, and reached 2.02 million tonnes in 1999 (Figure 2.9). The year with the highest exports of tobacco leaf was 1996 (2.03 million tonnes) see Table A.3.1). Developing countries are the major exporters with Latin America and Caribbean having the highest share. China's trade, as a proportion of its dominant production and consumption, is quite small, and this picture has not changed over the past 30 years. Even with China now a member of the WTO, trade in tobacco products may change little because the tobacco economy in China is state-managed. Developing countries exported about 0.75 million tonnes of tobacco leaf in 1970-72. With some small fluctuations during the period 1972 to 1999 the exports in 1999 increased to 1.26 million tonnes (Figure 2.9). The major exporters among developing countries are Brazil and Zimbabwe. Brazil's exports averaged about 90 000 tonnes in 1970-72, jumping to 340 000 tonnes in 1999. Zimbabwe's exports expanded from 60 000 tonnes to 160 000 tonnes over the same period. Exports of leaf from developed countries increased from 560 000 tonnes in 1970-72 to 760 000 tonnes in 1999. The EU and the United States are the major exporters among the developed countries (Table A.3.1). Developed countries, particularly the United States and the area of the former USSR, are the major importers. Tobacco leaf imports to the United States increased from 0.11 million tonnes 1970-72 to 0.24 million tonnes by 1999, while those of the area of the former USSR increased from 0.08 to 0.36 million tonnes (a fivefold increase) during the same period. The EU is a major importer with imports of 0.40 million tonnes in 1970-72, which grew to 0.8 million tonnes in the early 1990s, but contracted to less than 0.3 million in 1999 (Table A.4.1). Developing countries imported about 0.21 million tonnes of tobacco leaf in 1970-72, while by 1999 imports had increased to 0.42 million tonnes (Figure 2.10). The major importers among developing countries are the countries of the Near East and the Far East. In 1970-72. Near East imports totalled about 0.03 million tonnes and by 1999 had expanded to 0.12 million tonnes. Far East imports expanded from 0.09 million tonnes 1970-72, to 0.18 million tonnes in 1999. The growth rate for tobacco exports from developed countries averaged about 0.4 percent annually during the period 1970 to 1999. Shares of major exporters are shown in Figure 2.9. The weighted average of export unit value of tobacco of the six major exporters increased rapidly to the mid-1980s and has fluctuated around a stable trend since then. (see Figure 2.11). The world experienced an increase in cigarette exports during the period 1970 to 1999 (see Figure 2.12). In 1970-72, exports of cigarettes averaged 0.16 million tonnes, and by 1999 they had increased to 0.94 million tonnes. (see Table A.3.4). Developed countries are the major exporters with European Union having the biggest share. Cigarette exports from the EU increased from 0.04 million tonnes in 1970-72 to 0.37 million tonnes in 1999. Among the EU member countries, the Netherlands is the major cigarette exporter. The developing countries' share in world exports has increased but it remains quite small. From about 0.02 million tonnes of cigarettes in 1970-72, developing country exports increased to 0.26 million tonnes in 1999 (Figure 2.12). The major exporting region among developing countries is the Far East. Along with traditional exporters such as the EU (Netherlands, Germany, United Kingdom) and the United States, Singapore has developed as a major cigarette exporter in the Far East, far in excess of domestic consumption, although it is not a producer of tobacco. Developed countries are the major importers, with the EU and the area of the former USSR having the highest shares (Table A.4.3). The developing countries increased their imports of cigarettes from 0.03 million tonnes in 1970-72 to 0.21 million tonnes in 1999 (Figure 2.13). The major importing developing region is the Far East. The EU, a major exporter, is also a major importer of cigarettes along with the area of the former USSR and Japan. The United States is an importer of small quantities. Other tobacco products include cigars and smokeless non-manufactured products. World exports of cigars increased slowly during the period 1970 to 1998 from 0.01 million tonnes in 1970-72 to 0.03 million tonnes in 1998. In developed countries there were some wide fluctuations during the period. The major exporter among the developed countries is the EU, while the United States exports small quantities of cigars. After the period of 1990-92 exports of cigars contracted radically. Latin America and the Caribbean is the main exporting region among developing countries. The major importers of cigars are the EU and the United States. Global exports of other tobacco products increased significantly from 55 000 tonnes in 1970 to 330 000 tonnes in 1998. (Table A.3.6). The major exporters among developed countries are the EU and the United States. The Far East region is the main developing exporting region, with exports having increased from 3 000 tonnes in 1970 to 4 000 tonnes in 1998. World exports of other tobacco products increased at about 6.7 percent per annum between 1970 and 1998. In developed countries exports increased at about 6.2 percent annually. In the EU, they increased by 6 percent annually and in developing countries by 10.7 percent annually. World imports of other tobacco products increased from 22 000 tonnes in 1970 to 233 000 tonnes in 1998 (Table A.4.5), concentrated in the developed countries where imports increased from about 19 000 tonnes in 1970 to 158 000 tonnes in 1998. The major importer among developed countries is the European Union, while United States imports remained stable at about 3 000 to 4 000 tonnes. In developing countries the main importing region is the Near East.